We are thrilled to announce an innovative new content partnership with the International Zoo Educators Association (IZE). Made of up almost 500 members around the world, IZE's vision is to "conserve global biodiversity through effective zoo and aquarium programs." Through San Diego Zoo Global Academy, IZE will now have a new way to spread its message and information—and our Academy participants will be the beneficiaries! As part of the partnership, IZE members—who are professional educators and interpreters—will be able to create online courses with the San Diego Zoo Global Academy's Create A Course option. This feature gives members the tools to efficiently and cost-effectively create great training—but it gets even better. Academy staff will evaluate IZE member-created DIY modules and select the best ones. Those deemed worthy will be converted to San Diego Zoo Global Academy modules by our team of professional instructional designers, and the modules will be available to all our subscribers. IZE is the education arm of the World Association of Zoos and Aquariums (WAZA) and represents zoo and aquarium educators from around the world, including the following regions: Africa, Europe and the Middle East, Australia and New Zealand, North and East Asia, South Asia, North America, and Latin America. Located on the equator and in the heart of East Africa, Kenya is slightly more than twice the size of Nevada. Kenya cradles in her arms the Great Rift Valley, the Maasai Mara Reserve, and the Amboseli National Park—but Kenya's national treasure is her wildlife. 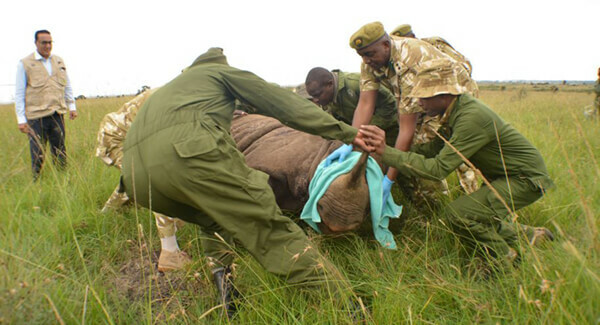 The protection, care, and conservation of Kenya's wildlife falls to the men and women of the Kenya Wildlife Service (KWS). KWS staff are currently charged with the 24-hour-a-day care of the world's two remaining northern white rhinos. In every respect, the dedicated women and men of the KWS are conservation heroes. Effective conservation programs rely on effective collaborations. For many years, San Diego Zoo Global has recognized this fact, and has been busy building strategic partnerships around the world—especially with in situ conservation partners like the Kenya Wildlife Service. During the past four years, San Diego Zoo Global has hosted two teams of veterinarians, animal care specialists, and rangers from KWS. Each team spent two weeks in San Diego meeting with staff, visiting the Zoo and Safari Park, and touring our animal care facilities and hospitals. The goal for these visits was to develop and deepen our personal relationships, collaborate, learn from each other, and ultimately help our friends in Kenya to build their capacity, in order to accomplish the enormous and important job protecting the wildlife of East Africa. The interest KWS expressed in the Academy's courses came first through a trusted intermediary, and Jon Prange (Academy director) and I were absolutely delighted to learn of the Kenyans' interest in the Academy's online animal care training programs. As I mentioned in my December 2018 newsletter column (archived here: http://www.sdzglobalacademy.org/newsletter.html), Africa enjoys amazing cellular connectivity, even deep in the bush. We are excited to announce a new arrangement between the KWS, San Diego Zoo Global, and the Academy. The San Diego Zoo Global Academy's online animal care training courses are now available to help supplement the training of the KWS staff. What an amazing, feel-good moment this is for all of us: building capacity, sharing our passion for wildlife conservation, learning from each other, and being in a position to support others in their work, half a world away. We live in an amazing time in human history! 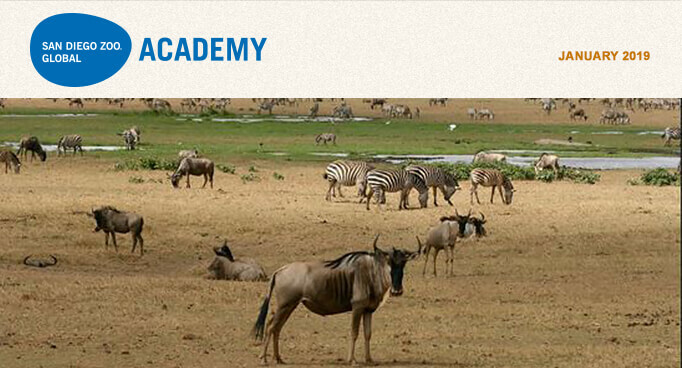 The Tulsa Zoo in Tulsa, Oklahoma is part of the Academy's collaborative learning environment! To keep ahead, each one of us, no matter what our task, must search for new and better methods for even that which we now do well must be done better tomorrow. Note: This edition of "Getting Better All the Time" is written in collaboration with Sabrina Brando, director of Animal Welfare for the World Association of Zoos and Aquariums. In devoting our lives to working on continuously improving animal welfare—and endeavoring to do so across the caring zoological profession (in zoos and aquariums) and throughout the world—we remain mindful of the starting place for such positive change. It always starts with one person, one thought or idea, one action, or one conversation, to make a change for one or more animals at a time. It may seem small, and the process may seem frustratingly slow to some, but it works and can be highly effective at producing change that is good and lasting. Each one of us, whatever our role, is fortunate to have the ability to act on behalf of animals and their interests and well-being. We have the opportunity to act because of the animals within our care and the care of our zoological organizations. We have the honor, delight, and responsibility to act. The more that we seize upon that responsibility and act in an enlightened manner for the benefit of each individual animal (and each affected species), the greater the positive difference we can make. The most powerful action each one of us can undertake in any moment may be invisible at the outset. A thought itself, unseen until translated into some form of expression or manifestation, can change the world. We focus on exploring opportunities and searching for possibilities, instead of focusing on obstacles and what cannot be achieved. We ask "What can we do? ", as there is almost always something that we can do. And that's what we strive to do every day—to change things for the better for the animals in our care and in the wild. It is simply beautiful to realize that we can act to choose or create our thoughts—each moment—and do so in a manner that can change the world. All that just by changing our thinking. For example, criticism may or may not be correct or constructive, and too often, it is used to undermine rather than build and better things. Yet, we can always choose to use such criticism constructively. That sort of thinking and corresponding action is transformational, and it is the way to demonstrate our overriding commitment to the animals in our care. This is one of an infinite number of ways we can lift our thoughts, develop ourselves, and better serve animals. Choose or create a good thought. Think about one thing differently. Ask yourself, how can this be improved in a meaningful and measurable way? Start with that one thought, one action, and one animal—and the world will be a better place. The U.S. Animal Welfare Act (AWA) is a starting point to be built upon through accreditation, certification, and ongoing professional development. Excellence Beyond Compliance® is an individual mindset, organizational culture, and collective consciousness, wherein animal welfare and animals' interests drive everything we do—and we strive to continuously improve our service on behalf of animals (including their well-being, protection, and conservation of species in the wild). Leveraging the AWA and the expertise and guidance of agency leaders is an outstanding means of getting better. Photographs taken by the inspector during an inspection: These should be shown to you during the inspection exit interview, to help you and your organization better understand any suggestions or concerns. It is further recommended that the zoological organization itself take photos and videos as appropriate during the inspection, to facilitate in-house discussion, learning, and follow-up, including any corrective measures and improvements. Special circumstances regarding animal inventory counts: The Inspection Guide emphasizes the importance of the inspector getting and confirming an accurate and complete inventory (or census report of resident animals). Provision is made for animals and species whose behavior may make it impossible to find or observe them at certain times of day or year, and for situations with large groups of animals or naturalistic and expansive habitats. These considerations are helpful, in that the agency recognizes that the animal's well-being should take precedence over having the head count be perfect during an inspection. Zoological organizations must be vigilant in maintaining good records of the resident animals and demonstrating advanced means of monitoring and observing those sometimes hard-to-view animals. This is how the inspector will assess the facility in such situations, to assure animal welfare. Determining adequacy of veterinary care: This section discusses the inspector's methods for examining the adequacy of veterinary care, especially when an item of concern is identified during the inspection. Another section on veterinary care, Recognition of Pain and/or Distress, identifies signs to prompt further examination of potential pain or distress and that may be helpful to review to confirm the adequacy of existing staff training, as well as observation and reporting related protocols. Marine mammal facilities: This portion of the Appendix provides a thorough and detailed overview of the marine mammal regulatory requirements the inspector should review and assess at a zoological organization maintaining marine mammals. Key items noted include veterinary care; space, as well as marine mammals housed in unusual circumstances; feeding, including prep, quality, and nutritive value; water quality; shelter and shade, with a focus on eye health; public barriers; separation; employees; and recordkeeping. All organizations caring for marine mammals should immediately review these pages, and use them as a checklist for regular periodic self-inspection. This will eliminate preventable noncompliances and allow marine mammal facilities to foster improvements in these areas. Choose to think better, to create positive change, to act, and make the most of the opportunities afforded us to make all the difference in the world. For those of you in Southern California, on the evening of February 13, 2019, James F. Gesualdi will be speaking at the Aquarium of the Pacific in Long Beach on "Shifting from Being Right to Doing Right for Animals." Visit http://www.aquariumofpacific.org/events/info/shifting_from_being_right_to_doing_right_for_animals/. © 2019 James F. Gesualdi, P.C. and Sabrina Brando. The opinions expressed herein are solely those of the authors. This is not, nor should it be construed as, legal advice. 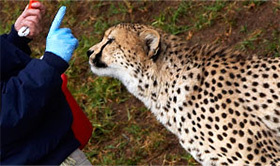 For more information on the World Association of Zoos and Aquariums, visit http://www.waza.org/en/site/home.